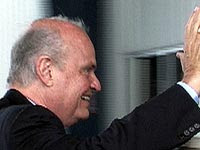 FairTax News: Former Senator Fred Thompson came to Houston to attend a fundraiser as he considers throwing his hat into the ring for the 2008 presidential primaries. A small rally was held at the airport for his arrival, and FairTax supporters were out in some force. FairTax.org is determined to put the FairTax on the national agenda during this election cycle, and to that end, supporters are asking each candidate and potential candidate "The Question": "If Congress passed the FairTax Act and you were President, would you sign the bill into law?" Despite an enormous amount of jostling from the crowd and media people, we were able to get his answer on videotape - Absolutely! Click here to watch the video. Mitt Romney - No - haven't had time to consider it. Tags: FairTax Plan, FairTax, Fred Thompson, presidential candidate, Republican To share or post to your site, click on "Post Link". Please mention / link to the ARRA News Service. Thanks! I hate to sound like a wacko, but you could just vote for Ron Paul and have the biggest decrease in government you've ever seen. I'm sorry, but what is so great about Fred Thompson? Robert, thank you for reading the ARRA blog. I enjoyed your bio and the fact that you - as a soon to be voter - are thinking about issues. I too am an Ayn Rand fan. Also, many Republicans are at heart libertarian in the general sense of the scope you defined: "as long as someone isn’t directly infringing on your right to life, liberty, and property, you should leave them alone." However, the definition get a little more complicated when "life happens" and we are forced to consider the aspects of community or even how a society defines property. Things become a little more complicated when people have already formed into communities and have establish government. The point of posting about Fred Thompson agreeing to support the FairTax option is to inform not to promote Fred over any other candidate at this early stage. That is why the additional info was posted on who has and has not endorsed the FairTax proposal. However, there seems to be a misconception that if Ron Paul were elected president, the size of government would decrease. I guess if a President Ron Paul were to brings in half the staff that a normal president - that would be a decrease in government. Also, he could opt to not nominate cabinet positions, court judges, ambassadors and other executive positions. He could order that government civil service positions not be filled. He could withdraw diplomats and close embassies. However, the US president is NOT a dictator although we sometime wonder about various presidents decisions and actions. A President Ron Paul would have no authority to stop current laws. He would have no authority to close the IRS or any other department of the Government. I am not saying he would do such, but if he were to veto all bills not to his liking -- such an obstructionist position would destroy the party he represents and would result in Congress uniting regardless of party to override all vetoes. We need the current IRS system replaced to free the Americans from taxing labor which is a free exchange of value often without gain of profit to either party. Why are we taxing people's labor and why continue such a destructive system. Why wouldn't Congressman Paul agree to a fairer tax system than the current intrusive IRS and the system taxing the labor of people which makes everyone a slave of the state. Why hasn't he agreed to cosponsor the FairTax bill?